The Chilean river otter is found in central and southern Chile and Argentina. They inhabit both marine and fresh water, along rocky coasts and canals. They prefer areas lined with dense vegetation, where the waters are calm. The Chilean is a medium-sized otter. Like all river otters, the Chilean has a thick, cylindrical, elongated body set on short, stocky legs. Their velvety coat is dense and short, and is a dark brown in color with a very pale, almost white, underside. They have a soft, wooly undercoat covered by coarse, shiny guard hairs. These guard hairs keep the undercoat dry when the animal is wet, keeping the animal warm and insulated. Unlike other aquatic mammals like seals, otters lack an insulating layer of body fat, so they rely solely on their fur to keep them warm and dry. Their head is rounded and flattened, with small, round ears set low on the head. Their muzzle is short and broad, and rounded in shape, and covered in thick whiskers. The thick neck is short, and is as wide as the head. They have small, round eyes that are set high and wide apart. The thick, conical, muscular tail tapers from the base to the tip. The paws are webbed, and they have five toes on each paw. Otter's front legs are shorter than their back legs, and this allows them to swim better. When otters swim slowly, they paddle with all four webbed paws. When swimming quickly or diving, the shorter front paws are kept close to the sides of the body, and the back legs and powerful tail propel then through the water. The ears and nostrils can be closed when they dive underwater. Their webbed feet have very strong claws. Females have two pairs of mammae. The Chilean river otter feeds on fish, crustaceans, mollusks, and birds. Their diet varies considerably throughout their range. In Chile, they feed equally on fish and crustaceans, while Argentinean populations feed primarily on crustaceans, seldom feeding on fish. The reproductive habits of this species are not well recorded. It is assumed to be similar to related otter species. This species has a very short lifespan. Very few live to be adults, and only 1% live to 10 years of age. This otter species is mostly solitary. Males and females only come together to mate. Social groups consist of mother and cubs. 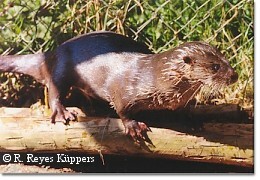 The Chilean, like most river otters, are primarily nocturnal. They have home ranges like all river otter species. The Chilean river otter is threatened due to hunting for their fur, habitat loss and pollution. Despite being a protected species, poaching is still a major threat to this species. They once ranges all throughout Chile, but hunting has exterminated them throughout much of their former range, and fragmented their populations to seven isolated areas in Chile. Habitat loss is especially catastrophic to this species, since they only live in areas of waterway with dense vegetation. 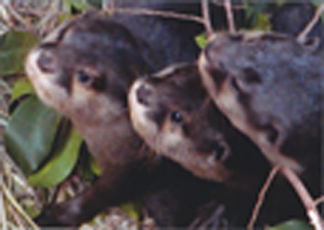 No subspecies are known for the Chilean river otter.